The sheriff's office is now offering a $20,000 reward for information in helping capture the escapees. Rogelio Chavez (R) and Laron Desean Campbell (L) escaped from Santa Clara County jail on Wednesday about 11 p.m. Nov. 23. 2016. 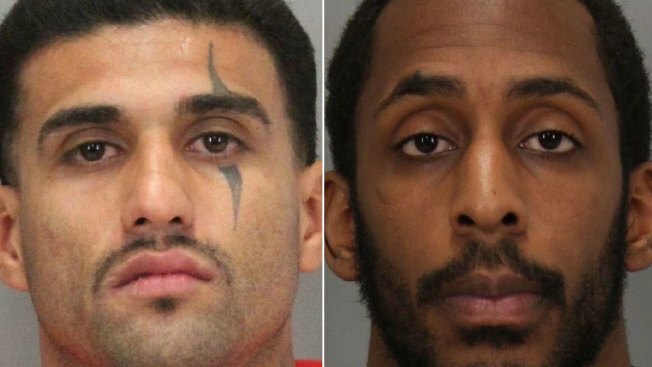 The manhunt for two inmates who cut off jail window bars and rappelled out of the Santa Clara County Main Jail in San Jose on the eve of Thanksgiving continued Sunday. Since offering a $20,000 reward for the capture of the escapees Friday, the Santa Clara County Sheriff's Office has not announced any significant updates regarding the search. The two inmates, 33-year-old Rogelio Chavez of San Jose, who is distinguished because of a large line tattoo over his left eye, and 26-year-old Laron Desean Campbell of Palo Alto escaped Wednesday at 11:08 p.m. after breaking through the bars and rappelling down two stories with the help of bed sheets and clothing, which were tied together, Sgt. Rich Glennon said. Authorities had originally made public two spellings of Campbell's first name. Authorities on Friday said search dogs tracked a scent of the escaped inmates along Guadalupe River in San Jose, near Interstate 880, and into a trail in a neighborhood near Levi's Stadium in Santa Clara. Chavez had been held at the jail since Aug. 17 on various charges including burglary, extortion, false imprisonment, resisting arrest, and firearms violations. An online court records search in Santa Clara County showed he had been charged at least 34 times since 2005. Chavez's stepfather spoke to NBC Bay Area Friday and demanded that the inmate turn himself in after saying that the escape was not a smart move. Campbell had been held in the jail since February 2015 on various charges including robbery, false imprisonment, criminal threats and firearms violations, records indicate. An online record search showed that Campbell had been charged with four crimes since 2013 in Santa Clara County. Courts were closed by Thursday and Friday, so a deeper understanding of their past crimes was not possible. 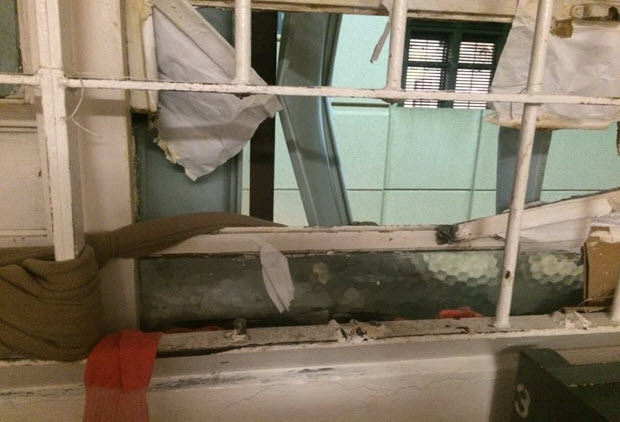 A deputy on patrol Wednesday night noticed the clothing hanging from the window and authorities were able to immediately catch two other inmates who tried to escape. But Chavez and Campbell got away. It is unclear how the inmates got their hands on tools to cut the window bars, Glennon said. A full-day search on Thanksgiving for two escaped inmates turned up nothing, Santa Clara County sheriff's officials said on Friday, as they continued to scour the area for the suspects who cut off jail window bars and ran off into the middle of the night. Rick Boone reports. Sources told NBC Bay Area late Friday that the jail confiscated at least one hacksaw blade in the last few months. The hacksaw blade was confiscated in another wing and different floor of the main jail from where Wednesday's escape took place, according to sources. On Friday, sources said that one of the two inmates who was captured during the jail break is Yasindu Desilva, who had been arrested Sunday night after a home invasion in Cupertino. Sources tell NBC Bay Area Desilva and the other inmate who was caught went out the window about 30 minutes after the first two inmates. While there has never been an escape from the main jail, there have been other escapes from other parts of the county's jail system. In March 2015, Johnell Lee Carter, a child molestation suspect escaped from a deputy's grasp while getting medical attention at Valley Medical Center. U.S. Marshals helped track him down a month later in Mississippi. In August, an inmate tried to break free from the Elmwood Correctional Facility in Milpitas; he was trying to leave so fast, he left his jail-issued sandals on the fence. Newly installed video cameras helped a deputy sot Christopher Boscacci, climbing, and then falling, over the fence, which led to his quick arrest. The escape in the main jail was not caught on camera because there are no cameras in the part of the jail the inmates were living. Sheriff’s deputies said this particular section is older, and was constructed in the 1950s. Sources from inside the jail told NBC Bay Area it’s possible the inmates had help in getting away. Anyone who sees them should call 911. Anyone who knows where they might be should call 408-808-4500 or the anonymous tip line at 408-808-4431. NBC Bay Area's Damian Trujillo contributed reporting.